One of the things I generally like about European crime fiction is that it isn’t as full of psychopaths and violence as mainstream American and English novels can be but this one seems squarely aimed at that market. It’s undoubtedly a smart move economically, those books sell like the proverbial hot cakes, but it doesn’t fully engage me. Dead children in odd costumes. A religious cult. Several characters fueled by madness including a serial killer with a convoluted motive. A police squad full of eccentric geniuses, including one with a death wish. The loved ones of our heroes in danger. 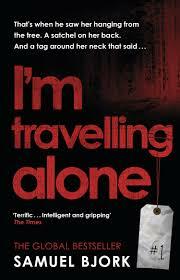 To me I’M TRAVELLING ALONE seemed as if it had been penned by someone more familiar with a “10 tips for great thriller writing” checklist than actual crime fiction of the kind I like. The forces of good are represented by an ageing, overweight chap called Holger Munch.He’s divorced with an adult daughter and a 6 year old granddaughter he adores. His closest colleague is Mia Kruger. A thirty-something loner, bordering on alcoholic, who is planning her own suicide when the book opens. For reasons that become clear as the story progresses. For me the most compelling police character is young Gabriel, a hacker who has taken a ‘real’ job now that his girlfriend is pregnant. The way he approaches the transition from one sphere to the other (teenager to adult, potential criminal to police worker) seems most real to me and I’d have liked to see more of him. Evil is represented by a somewhat confusing cacophony of characters and story threads, at least one of which is almost entirely pointless. Perhaps this wouldn’t have bugged me as much if the book hadn’t been so long. There is a lot of exposition here and countless 2-page spreads without a paragraph break or dialogue…just endless words. The story was just engaging enough to keep me reading (with only a moderate amount of eye-rolling) but I will admit to skimming some of the exposition. This entry was posted in book review, Norway, Samuel Bjork. Bookmark the permalink. Sorry to hear this one more or less let you down, Bernadette. I do have to agree about the two-page spread without a break. I find that sort of thing tiring, too. And I like the way you put that ‘checklist for a serial killer’ point, too. It expresses very well that formulaic feel that a lot of novels have to them. I’ll skip it. Description of the book doesn’t move me to read it, but the long pages without a break. Nope. These aging eyes need paragraphs or dialogue. I now look for that in books. This book was a DNF.